Preemptible instances are a type of on-demand instances. When you create a preemptible instance, you can set a maximum price per hour to bid for a specified instance type. If your bid is higher than or equal to the current market price, your instance is created and billed according to the current market price. You can hold a preemptible instance without interruption for at least one hour. After one hour, your bid is compared with the market price. When the market price exceeds your bid or the resource stock is insufficient, the instance is automatically released. Note After an instance is released, its data cannot be recovered. We recommend that you create a snapshot for an instance to back up its data before releasing it. Preemptible instances are ideal for stateless applications, such as scalable Web services, figure rendering, big data analysis, and massively parallel computing. Furthermore, applications that require a higher level of distribution, scalability, and fault tolerance capabilities, benefit from preemptible instances in terms of costs and throughput. Preemptible instances are not suitable for stateful applications, such as databases, because it is difficult to store application states if the instance is released because of a failed bid or other reasons. The following figure shows the life cycle of a preemptible instance. This mode means you always set the real-time market price as the bidding price. Moreover, there is an upper limit for your bidding price, namely the price of the corresponding Pay-As-You-Go instance type. If you use the ECS purchase page to create an instance, select Use Automatic Bid. If you use the RunInstances interface to create an instance, set the SpotStrategy parameter to SpotAsPriceGo. This mode means you must set the highest price you are willing to pay for a specified instance type. If you use the ECS purchase page to create an instance, select Set Custom Maximum Price (Per Instance/Hour). If you use the RunInstances interface to create an instance, set the SpotStrategy parameter to SpotWithPriceLimit. Currently, the maximum bid of a preemptible instance is the price of a Pay-As-You-Go instance of the same configuration. When creating a preemptible instance, you can set a price according to the displayed price range, business features, and the estimated future price fluctuation. When the market price is lower than or equal to your bid, and the resource stock is sufficient, the instance can be created. If your bid takes into account the estimated future price fluctuation, you can hold the instance even after the one-hour guaranteed duration. Otherwise, your instance may be automatically released at any time after that duration. When a preemptible instance is created, it has a guaranteed duration of one hour, namely, the first hour after it is created. During this period, the instance will not be released because of stock shortage, and you can run services on the instance as normal. Beyond the guaranteed duration, the market price and stock is checked every five minutes. If the market price at any given point of time is higher than your bid or the instance type stock is insufficient, your preemptible instance will be automatically released. The preemptible instance price applies to the instance type only, including vCPUs and memory, but does not include system disks, data disks, or network bandwidth. Instead, system disks and data disks are billed according to the Pay-As-You-Go billing method. Network bandwidth is billed according to the bandwidth billing rules of Pay-As-You-Go instances. For more information, see Billing of Internet bandwidth. Preemptible instances are billed by the second. When a preemptible instance is created successfully, the market price is an hourly rate and you only need to divide it by 3,600 to get the price per second. The cost incurred from creating a preemptible instance to releasing it is accurate to two decimal places. An accrued cost of less than USD 0.01 is not charged. Instances are billed according to the actual period of use. The actual period of use is the duration from instance creation to instance release. After an instance is released, it is no longer billed. If you stop an instance by using StopInstance or in the ECS console, the instance continues to be billed. During creation of a preemptible instance, it runs when your bid is higher than the current market price and the resource stock is sufficient. In the first hour of its running, the instance is billed according to the initial market price. After that, it is billed according to the real-time market price. 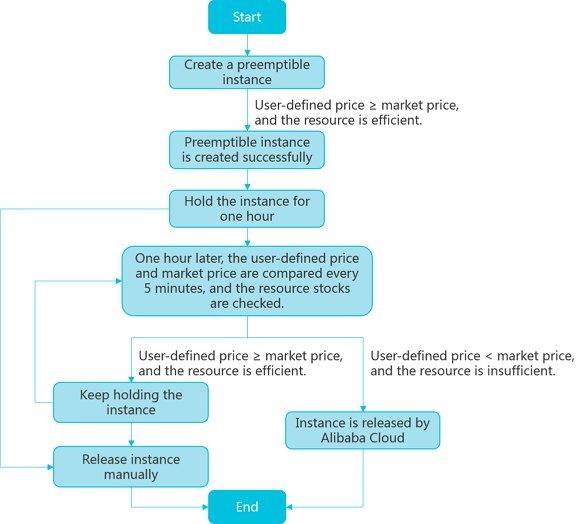 The market price of a preemptible instance fluctuates according to the changes in the demand and supply of a given instance type. Therefore, we recommend that you pay attention to and evaluate the market price fluctuations to ensure you can take advantage of lower computing costs and increased throughput when purchasing preemptible instances. For more information about the preemptible instance quota, see Limits. You can purchase a preemptible instance by using the RunInstances interface. After a preemptible instance is created, it can be used in the same way as a Pay-As-You-Go instance. You can also use it with other cloud products, such as cloud disks or EIP addresses. You can stop a preemptible instance in the ECS console or by using the StopInstance interface. VPC preemptible instances support the No fees for stopped VPC instances feature. The network type and the bidding mode of a preemptible instance determine whether it can start after it is stopped, as shown in the following table. If your bid is not lower than the market price and the resource stock is sufficient, the instance can be restarted successfully. If your bid is lower than the market price or the resource stock is insufficient, the instance cannot be restarted. If the resource stock is sufficient, the instance can be restarted successfully. If the resource stock is insufficient, the instance cannot be restarted. If your bid is lower than the market price or the resource stock is insufficient, the instance cannot be restarted successfully. When the guaranteed period ends, the instance is automatically released according to market price changes or if there is insufficient stock. Additionally, you can independently release the instance. When a preemptible instance is released because of market price changes or insufficient stock, the instance enters the Pending Release status. Then, the instance is released in about five minutes. You can use instance metadata or the OperationLocks information returned by calling the DescribeInstancesinterface to check if an instance is in the Pending Release status. Note Although you can check if a preemptible instance is in the Pending Release status by using the API and save a small amount of data while the instance is in this status, we recommend that you design your applications in such a way that your services can continue even if the preemptible instance is immediately released. You can release a preemptible instance manually so as to test whether your applications run normally if an instance is automatically released. Generally, preemptible instances are released in the order of bidding price, from low to high. If multiple preemptible instances have the same bidding price, they are randomly released. Set a proper bidding price. That is, we recommend that you evaluate and submit a competitive price and take into account the estimated market price fluctuations. By doing so, your request can be accepted and your created preemptible instances will not be released easily due to price fluctuations. Additionally, we recommend that you take into account your pricing expectations based on your own business assessment. The image must have all the software configurations that your applications need, making sure that you can run your business immediately after the instance is created. Additionally, you can use User data to run commands upon startup. Store your business data on storage products that are independent from preemptible instances, such as cloud disks that are not set to release together with instances, OSS, or RDS. Split your tasks by using grids, Hadoop, queue-based architecture, or check points, thus making it easy to store computing results frequently. Use release notifications to monitor the status of a preemptible instance. You can use instance metadata to check the instance status every minute. The metadata of a preemptible instance is updated five minutes before it is released automatically. Test your applications to make sure that they can handle the accidental release of instances. You can test your applications as follows: run the applications on a Pay-As-You-Go instance, release the instance, and then check how the applications handle the release. For more information, see FAQ about preemptible instances. For more information about using APIs to create preemptible instances, see Use APIs to manage preemptible instances.